Size 7 kids girls. 100% cotton. length 26.5". 15.25" shoulder width. Material: Cotton. 28" length. Armpit to armpit-12“ Shoulder to hem-23.5“. I want you to be 100% happy and satisfied. High-end expensive designer dress by Zara Girls of France in size 6 years. A beautiful dress for any special occasion, classic! 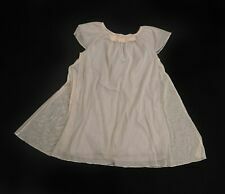 Zara white party girls dress- Zara girls. Zara Girls Dress. Cold Shoulder Style. Ruffle Bodice. Black Sparkle. Color on computer screens vary. Zara Winter Collection. Girl's blue sweater / jacket. Zara Girls Dress. Black and White Plaid, Short Sleeves. Grossgrain Tie Bow. Color on computer screens vary. Fit and Flare Style. Sleeve: 3". Glittery gold print. Velvet/velour feel fabric. Zara Girls Dress. Fit and Flare Style. make Supersized seem small. Blue Velvet with Sequins, Short Sleeves. Color on computer screens vary. Get images that. Lace detail. dark blue in colors. 17" chest (armpit to armpit). 31" length. Zipper Closure in the back. Great condition, no flaws. ZARA GIRLS DRESS. Color: OLIVE VREEN. Shell: 97%COTTON, 3% ELASTHANE. Zara Kids Girl's dress, 9-10 years. straight fit, lace in front and sleeves. dress lined, but not sleeves. ZARA GIRLS DRESS. Shell: 100% VISCOSE. Color: MULTI COLOR, FLORAL. LONG SLEEVE. ZARA GIRLS DRESS. SOFT VELVET. JEWEL DETAIL. CHRISTMAS EDITION. Color: BROWN. UNDERARMS: 14", WAIST: FLARE, LENGTH: 29". Zara Girls Soft Collection- Fabulous Girls Dress - Robin Bird Print Age 13-14 Years. Condition is New with tags. Dispatched with Royal Mail 1st Class. Lovely and like new. 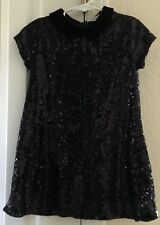 Little Girls black sequined dressy dress by Zara Girl, size 5. Black velvet Peter Pan collar and zipper close back. Fully lined. In perfect pre-owned condition. Length(Top of Shoulder to Front Hem ): 29.5”. Sleeves(Center back of theCollar to Cuff ): 10”. For sale I have thisSTUNNING girlsDRESS from 'ZARA'. GORGEOUS QUALITY FABRIC WITH A FINE NET GLITTERY TOP. I think there's a tiny spot on the front, otherwise fine! Smoke and pet free home. 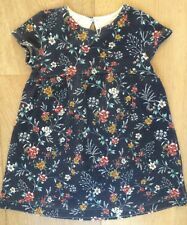 Zara girl 2-3 year toddler short-sleeved dress floral stretchy summer . Condition is Used. Dispatched with Royal Mail 2nd Class. GIRLS PARTY DRESS BY ZARA. AGE 7 years HEIGHT 122 cms. Girls Zara tartan woven Dress Age 7 Plaid, immaculate condition. Dispatched with Royal Mail 2nd Class. This beautiful dress was worn just time for a special occasion and it is in like new condition. It is a cap sleeve shift dress with a beautiful scattered floral print on the front and back. It is a pull over style with one back button. It is 30” long and 15.5” across the chest. The dress comes from a smoke free home and is a beautiful special occasion dress, but can also be worn casually. I will combine shipping if you purchase multiple items for 1.50 more per item and will send you an invoice. Please pay for the item within 7 days of purchase, or it will automatically be re-listed. Thanks! THIS ZARA DRESS IS ADORABLE! WITH POCKETS! Zara Girls red and white tweed-style tunic dress. Cotton and polyester. Does up with a little red button at the back. Hangs beautifully. Zara Girls Long sleeved Black floral /stripe pattern dress 12/13 Years. Condition is Used. Dispatched with Royal Mail 2nd Class. Gorgeous dress worn once by my daughter, as usual. This is in superb condition as new. Superb quality and looks great. Please check the feedback and photos. Comes from a smoke and pet free home. Thanks for looking. Worn once for a special occasion Will be dispatched within 24 hours of ordering I also give postage discounts when people purchase more than one item Also if you want the item before bidding ends just send me an offer. In very good condition dress. Beautifully decorated suitable for ordinary dress a unique charm. Zara Kids Girls Red Burgundy Tweed Short Sleeve Shift Dress. Size: 13-14 years / 164cm.